We ran into some major rain when we arrived in North Dakota. It was white knuckle time for my wife who was driving. 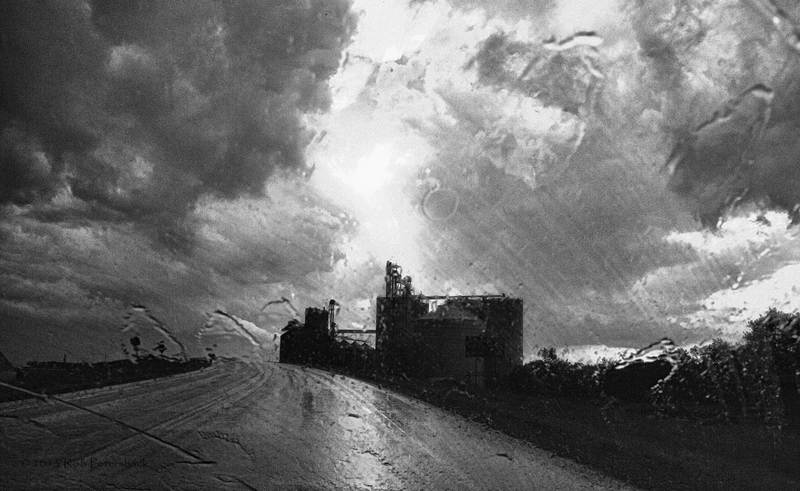 Nearly blinded by the rain an opening in the clouds suddenly showed that we were close to a large grain elevator that appeared directly in front of us although the road actually curved past it. As the windshield wipers cleared the view for a split second I took this photo. Of course I was there so it isn’t surprising that I think it is a pretty good landscape photo with the rain on the windshield and the apparently slick and presumably dangerous road pulling the viewer into the picture and into the building. The distortion caused by the wide-angle camera lens gives the image the feeling of a carnival grotesquerie. Its unusual perspective also adds to the image. That’s my take, I sure would appreciate comments on this one.